The Golden State Warriors have the claim to fame that can never be taken away from them. The Warriors won the first ever championship. The Warriors are such an old team that their first title came before the NBA. The Warriors were located in Philadelphia when they won the first ever Basketball Association of America (BAA) championship. After two more seasons as the BAA, the BAA and the National Basketball League (NBL) merged to form the NBA. After their success winning the title in the inaugural season of 1947, the Warriors would continue their fine play as a team. They would return to the Finals in their second season, but they would lose to the Baltimore Bullets. The Warriors were constantly one of the better teams in the league during the early years. They won the title again 1956 for their first title since the two leagues merged into the NBA. In 1959 the Warriors drafted one of the greatest players to ever play the game of basketball. Wilt Chamberlain became a sensation in the NBA because of his dominant scoring, rebounding, and shot blocking abilities. Wilt Chamberlain holds numerous NBA records including the record for most points in a game when he scored 100 points against the New York Knicks. He also averages the second most points per game after only Michael Jordan by a fraction of a point. The Warriors continued to play superb basketball in the 60’s. They would make it to the Finals twice in the decade, but they lost both times. The first time they were victims of the Boston Celtics who won eight straight titles in that stretch of time. They then lost to the Philadelphia 76ers who replaced the Warriors in Philadelphia when the Warriors moved to California in 1962. The loss to the 76ers was especially rough due to 76ers now playing in their old city as well as the fact that the Warriors traded their superstar Wilt Chamberlain to the 76ers. After the Warriors left Philadelphia in 1962, they moved to San Francisco in the state of California. 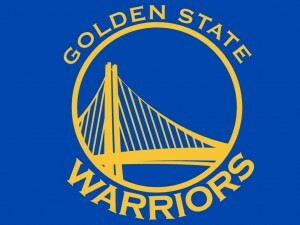 They played there until they moved across the bay area to Oakland and became the Golden State Warriors in 1971. The Warriors kept up their good play as a playoff team in the 70’s. They made the playoffs every year in the decade but one. They also won another NBA championship which was their third as a franchise. They were led mainly by Rick Barry during those days. He was one of the greatest free throw shooters in NBA history. He also developed into one of the best shooters in general in NBA history. It was behind his leadership and will to win that the Warriors won their championship in 1975. That was one of the greatest upsets in NBA Finals history. Few people expected the Warriors to advance far in the playoffs let alone win the title. Their own team did not even reserve the arena for the time of the Finals because they did not expect them to make it, so the Warriors played their home games in the Finals in a near by arena. After their surprise title in 1975, the Warriors began to regress. By the 80’s they were no longer a playoff team. They were not the competitive Warriors that the league knew up until that point. They would struggle until the end of the 80’s. They would become a playoff team again behind the play of Tim Hardaway, Mitch Richmond, and Chris Mullin. The three of them led the Warriors back into the NBA playoff scene. That would not last though as the Warriors have fallen out of the playoff scene yet again. There have been times of hope in which the Warriors had young promising players, but the team has not been able to put together enough wins to be a consistent playoff contender. The only bright point in the past few decades for the Warriors is when they defeated the Dallas Mavericks in the 2007. The Warriors were the first ever 8 seed to defeat a 1 seed in a best of seven series. A few 8 seeds had beat a 1 seed, but it had never happened since the NBA made he first round of the playoffs seven games. The Warriors were led by Baron Davis during the remarkable run. The Warriors have been plagued by injuries since then. They have not had the most talented teams, but baring injury the Warriors could have made a few runs at the playoffs. That would not be the case however. The Warriors have begun to head in a new direction. The Warriors have been led by Monta Ellis for the past few seasons, but they traded their leading scorer to the Milwaukee Bucks for the often injured Andrew Bogut. Bogut will not play the remainder of the season. The Warriors hope to build a playoff team in the coming seasons led by Bogut and sharp shooter Stephen Curry.